Begin your magnificent Kimberley experience with a spectacular sunset over Broome’s Cable Beach, then enter a magical world of rich waterways, plunging gorges, stunning rock formations and prolific wildlife. Meet the residents of a remote Aboriginal community and tour the world’s principal source of rare pink diamonds. Experience the Ord Valley’s gourmet produce at a unique private dinner, and end your trip in tropical, cosmopolitan Darwin. 10 nights departing select dates May - September 2019. Incldues accommodation, guide, airport transfers, daily breakfast, 2 lunches & 9 dinners. Marvel at a Cable Beach sunset. Enjoy two nights in Broome. Relax on Chamberlain Gorge with morning tea. Travel on the Gibb River Road. Taste the rum at Hoochery Distillery. Take a thrilling boat ride on the Ord River. Experience the Ord Valley's gourmet produce at a unique private dinner at Kununurra's Sandalwood Factory. 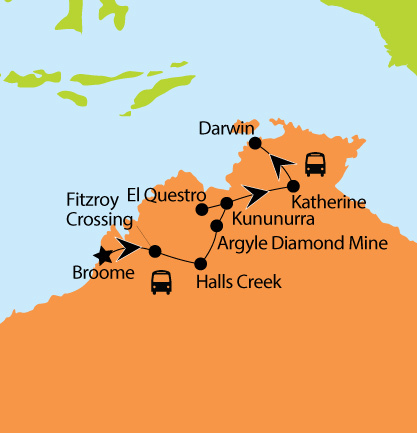 Cruise Katherine Gorge & see ancient Aboriginal rock art. Take in some history at Adelaide River War Cemetery. Indulge in food and wine on Darwin's waterfront.